Land reform. Are you on the south or the north bank? The Land Reform Review Group (LRRG) is due to publish its first report in the next few weeks. The Group, set up as an independent policy review group by the Scottish Government in October 2012 has been given the task of proposing innovative and radical proposals for land reform. Over 500 individuals and organisations have submitted evidence to the group. Think of the land reform debate as like opposite banks of a river. On the south side people are working together to try and make this system work better. There is co-operation and understanding and though nothing fundamentally changes, some modest progress is made. Folk are polite to each other and nothing much happens to rock any boats. On the north bank stand those who see the entire system by which land is held and governed in Scotland as fundamentally flawed. These people are working to undermine landed hegemony and reform the way in which landed power defined, derived, distributed and exercised. Some of these people may, on occasions, cross the bridge to the south bank to participate in a bit of consensual reform but most of the time they are on the north bank because that is where they need to be. Time spent on the other side of the river is ultimately futile and a waste of energy and resources if the desired outcome is radical land reform. So where do the Land Reform Review Group stand? Well, for a start there is no group. There is a Chair and two vice-chairs and no members. A group of three is a weak formation because it is hugely dependent on personal relationships. It is difficult to conduct robust debate within a group of three. A group of eight, on the other hand, allows for frank exchanges of views and a stronger critical approach. The current personnel are Dr Alison Elliot (Chair) and Vice-Chairs Dr Sarah Skerrat from the Scottish Agricultural College and Ian Cooke, Director of the Development Trusts Association Scotland. Recently, the only one of the three with a background and understanding of land reform, Professor James Hunter, resigned for personal reasons. The group is advised by 13 advisers. The LRRG looks distinctly like a group of south-bankers. Meanwhile another group is getting organised. Scottish Land and Estates (SLE) is the representative body of 2500 landowners in Scotland and is making strenuous efforts to ensure that land reform goes nowhere. It has invited Dr Elliot to give the keynote address to its AGM on 21 May 2013. Last year, the keynote speaker was the First Minister, Alex Salmond. Rather like Mr Salmond, whose speech was one of a committed south-banker and which gave Scottish Land & Estates a public relations coup, Dr Elliot’s speech will be closely observed by a growing number of people in Scotland who are beginning to worry about the direction in which the LRRG is heading. Mr Salmond, it should be noted, will be giving the keynote speech to the AGM of Community Land Scotland on 7-8 June on Skye. Like his speech last year, this is also keenly anticipated. By the 8th of June, therefore, we will have a fair idea of how the contours of the land reform debate are laid out and what side of the river folk are on. Scottish Land and Estates has also been raising cash. During 2012, as revealed in the accounts to be presented to its forthcoming AGM, it raised over £55,000 for a land reform fighting fund and plans to raise more during 2013. 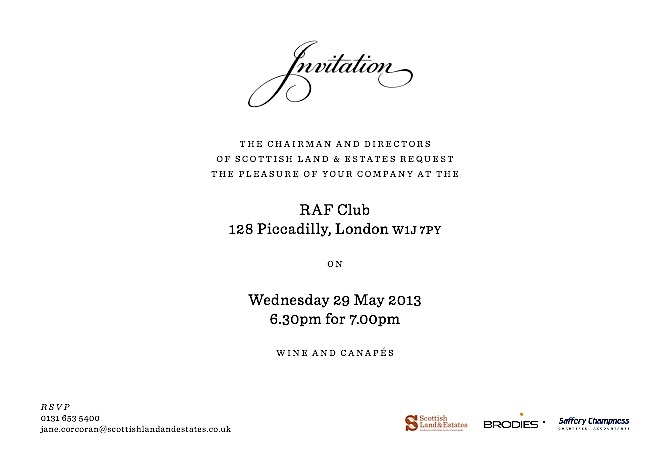 A reception is being held in the RAF Club in Piccadilly on 29 May (see invite above) during which no doubt the large number of London-based landowners will be pressed to contribute funds to protect their vested interests north of the border. Scottish Land and Estates also has wider connections to the work of the LRRG. Luke Borwick, its Chairman is a Board member of SRUC, the Scottish Government funded College that employs one of the Vice Chairs of the LRRG. The Chair of SRUC is one-time Conservative Scottish Office Minister and SLE member, Jamie Lindsay. Meanwhile one of the member of the SLE’s own Land Reform Working Group (Andrew Bruce Wooton) is also an adviser to the LRRG. Details of the SLE’s working group can be found in the introduction to its full submission to the LRRG available here. The instincts and direction of the LRRG will be judged by its interim report and the extent to which it stakes out territory on the south or the north bank of the river. At the moment it seems like a lot of activity is taking place on the south-bank and those who should be working on the north lack the resources and determination of groups such as SLE who are busy wooing and embracing the south-bankers. What about all those people who walk back and forth on the bridges every day, instead of shouting at each other across the water? They exist. In vastly larger numbers than your metaphor implied. Hence, they cannot be ignored. Is there an organisation for those who do want meaningful reform of the land ownership in Scotland? Is the number of “co-ordinators and planners” of LAS big enough to conduct robust debate within? In fairness to the LRRG, at least we know who they are. Thank you for laying out the ‘geography’ of the debate in such a useful metaphor. For those of us who stand on the sidelines of both banks but are genuinely concerned and wish a proper more equitable distribution of land and resources, what would you advise as a course of action? How do we contribute to the debate? Where is the forum? Who do we change things? I have watched a small community in the north of Scotland reject by apathy the opportunity to take back their own crofts, grazings, etc. I don’t understand why? My advice is to work locally, build awareness and understanding of the issues through active learning. And talk about the issue publicly. How patronising! Do you think crofters are stupid? It is an interesting question as to why locals can display apathy towards something that a lot of us see as fundamentally crucial. Perhaps it’s decades of a belief that they have no value in local decision making, and that their opinion is not important. All this firmly indoctrinated into them by lairds and factors. There is a growing number of us who will stand up and be counted, but alas more of us still fear the reprisal of the laird when it comes to negotiating the lease for our homes in the coming year. So we put our faith into the likes of the LRRG, but more so in our Scottish government. Others cannot understand our plight, and I sympathise with them, however, after a short discussion with them, and a few hard facts, they always leave my company with a different viewpoint on land reform. This reinforces your point Andy about open discussions, and a sharing of information. The landed elite have had their privileges bestowed upon them, and know no better. Things must change, and now is the time. Giles Sutherland talks about crofters. No crofter has to “fear reprisals from the laird when it comes to negotiating the lease for our houses in the coming year”. We are not living in the 19th century any more! This last comment displays exactly why tenant farmers need the same rights as crofters. Unbelievable , isn’t it, that tenant farmers appear to live indeed in the 19th century, where they do fear for their homes and livelihood.